Yokneam, Israel 14-Jan-2015 – Compulab is introducing fitlet – a miniature 0.22l fanless quad-core PC that is not only packing more features than any other PC in its class, but is also designed from the ground up for unprecedented openness: Memory, storage, networking, extension cards and operating system can all be easily installed and upgraded by the user. The Linux version of fitlet was developed with the Linux Mint team and will be available under the “MintBox Mini” brand. fitlet is powered by latest AMD low-power APU and is built into a sleek, passively-cooled ruggedized housing. Three fitlet models are offered in various configurations ranging from a plug-and-play Windows PC to a barebone system priced at $129. All models come with a 5 year warranty. fitlet is built around the quad-core AMD A4 Micro-6400T with Radeon™ R3 Graphics which packs high-performance, powerful graphics and rich up-to-date connectivity into a minimal power envelope. Compulab and Linux Mint will introduce in Q2’15 MintBox Mini – the smallest and most affordable MintBox to date built upon the fitlet platform. Function And Connectivity T-card (FACET card) turns fitlet-X from an everyday miniature PC into a powerful application specific instrument. The FACET interface includes 3 PCIe lanes, USB and LPC bus on a standard mini-PCIe connector. The housing is designed for simple incorporation of I/O connectors on the FACET card while keeping the professional look of the final product. “FACET cards give incredible freedom to OEMs and advanced users to tailor fitlet to their needs.” said Dr. Arthur Rabner, fitlet System Architect. “Since FACET is mini-PCIe compatible, a user can immediately install any off-the-shelf card, but the true power is with purpose built FACET cards incorporating multiple interfaces and I/O connectors”. fitlet-X LAN with FACET-LAN is an advanced networking appliance with four GbE ports. FACET is completely open for 3rd parties to design their own extensions to fitlet, with published electrical and mechanical design guide and a complete reference design. fitlet-i is a miniature, fanless and ruggedized PC, featuring all the expected functionality and then some. 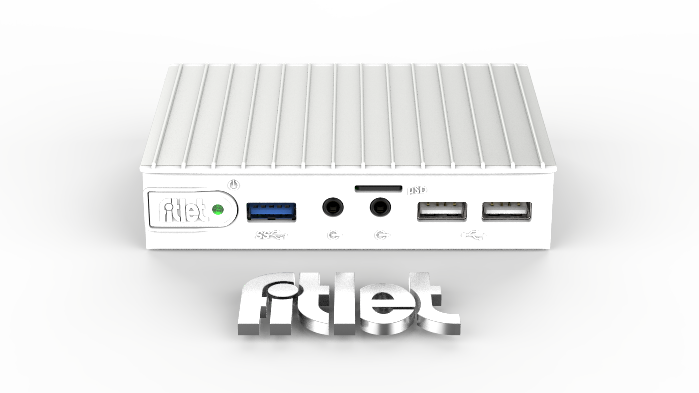 fitlet-i standard features are unusually rich for a computer its size, including up to 8 GB RAM, mSATA, dual head HDMI, dual GbE LAN, WLAN 802.11ac, micro-SD socket and 6 USB port (2 USB3). Beyond that, fitlet-i features a powered eSATA, RS232, SMBUS, UART, 8 GPIOs and provision for mobile data communication. All features are completely user accessible. A great deal of thought was given to real-world usability scenarios resulting in a long list of integrator-friendly features: power plug locking, USB plugs locking, replaceable battery, programmable power-on, remote power button, power button locking and robust mounting. If industrial PC applications have one thing in common it’s that they are all different. fitlet-X was designed to address this challenge by incorporating the FACET card (Function And Connectivity Extension T-Card). The first introduced solution is fitlet-X LAN, designed for advanced routing and network security applications. fitlet-X LAN provides four GbE ports without changing the form factor or reducing the standard connectivity found in fitlet. OEMs can quickly tailor fitlet-X to their specific requirements by designing a custom FACET card. Compulab will introduce additional off-the-shelf FACET cards in the future. fitlet-B is the entry level model that makes no compromise on build quality and reliability. Powered by a dual-core AMD E1 Micro-6200T with Radeon™ R2 Graphics, fitlet-B makes an extremely attractive building-block for applications in robotics, thin clients, telemetry and basic digital signage. Compared to the popular Compulab fit-PC2, fitlet-B is smaller, 2.5 times more powerful, has up to 4 times RAM capacity, dual head HDMI and comes with 5 year warranty. At $129 fitlet-B is less than half the price of fit-PC2. Note 2: fitlet-B and fitlet-X have different features. Please consult specifications. Compulab will start accepting orders for fitlet in February 2015 at a price starting from $129 for fitlet-B Barebone. fitlet can be ordered in North America and Europe through Amazon and worldwide directly from Compulab or from Compulab resellers.